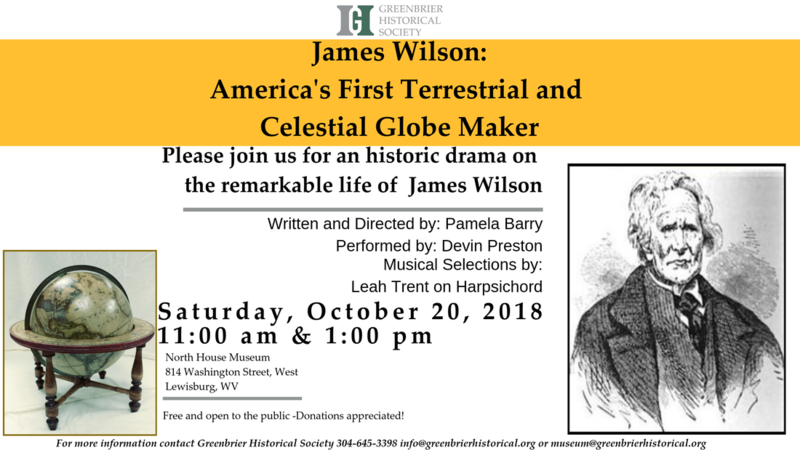 The Greenbrier Historical Society is proud to announce a new exhibit opening on Saturday October 20, 2018: James Wilson, America's First Terrestrial and Celestial Globe Maker. Wilson was a self-taught globe maker from New Hampshire. Wilson and three of his sons operated two manufacturing plants in Bradford, Vermont and Albany, New York. After just a few years of operation they were able to outsell the European globe makers who dominated the American market until then. A real American success story. The exhibit will include the historical society’s original, fully restored Wilson terrestrial globe. In 1828, production of this particular edition of his globe was stepped up in anticipation of more business from an advertising campaign that targeted academies and schools. Donor records reveal that GHS’s globe was used in a school or academy in Lewisburg at least 150 years ago. Another featured object is the first map made and engraved in America, on loan from Tom and Eugenia Sander. Printed in 1794, it is a map of Virginia by Samuel Lewis. In 1801 the unfortunate map maker wrote to Thomas Jefferson from debtor’s prison, begging the Vice President to convince the Virginia Assembly to pardon him. Jefferson praised Lewis’s work as being of the highest quality and brokered his release.